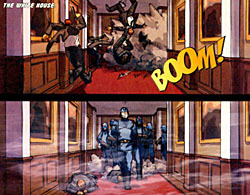 GI Joe may be the most successful licensed comicbook property ever. 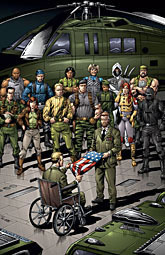 The original Marvel series ran for 14 years - 155 issues, not counting specials, crossovers and miniseries - and Devil's Due has been continuing the adventures of the Real American Heroes since 2001. The license is going to transfer to IDW Publishing next year, but DDP went out on a hell of a high note, with the year-long "World War III" storyline. When Cobra gains control of the world's most advanced weaponry manufacturer, they use that advantage to turn minor skirmishes across the globe into full-out wars! World War III has begun! While GI Joe is spread thin dealing with this, the world is ripe for conquering... enter Cobra Commander! The world - and GI Joe - will never be the same! 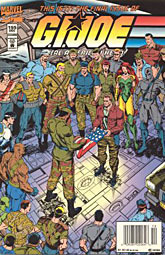 GI Joe has always been a political book, reflecting the times we live in. Read the old Marvel issues and you'll see Russia's Oktober Guard go from being mistrusted adversaries to reliable allies to a fractured, unstable force, just as the former Soviet Union did the same in the real world. And for their "World War III" story, Devil's Due kept that tradition alive: after a catastrophic attack on a major US city, our soldiers begin fighting a disorganized, losing battle battle against an enemy that seems able to strike anywhere, knows our weaknesses and is willing to do almost anything to achieve its goals. You can't deny that sounds like current affairs. 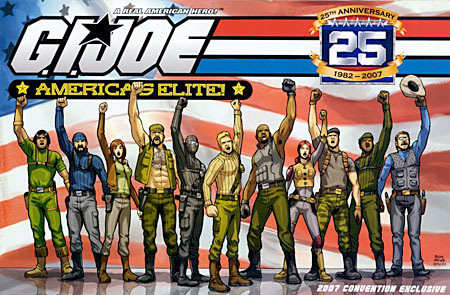 The story kicked off in GI Joe: America's Elite #25, which had a great gimmick to hook new readers: a cover that featured every single Joe character from the toys, comics and cartoons from the past 25 years. No really, all of them. Got a favorite Joe? An obscure one? He's on the cover. They even included a handy identification chart in the center of the book, so you can find everyone. It was worth the cover price just to get that alone, not to mention the three pages listing every known Cobra agent and their status - Captured, At Large or Deceased. Oh, and if you prefer the bad guys, there's a similar group-shot cover on issue 33, featuring a lineup of the villains. The story starts simply enough, with a handful of reserve members from the Joe team protecting a Chechan rebel leader in Dagestan. A Cobra sniper team attacks them, hijinks ensue. You get the idea. Meanwhile, Cobra Commander is busy recruiting. He's riding in a helicopter with a disillusioned army lieutenant. He actually makes a very nice sales pitch (you'd expect nothing less from a former used-car salesman), giving the soldier a chance to intervene directly against the Janjaweed militia terrorizing Darfur, pointing out how Cobra can strike quickly against the filth that bureaucrats ignore. Admit it: if he pitched that to you, you'd seriously have to consider the offer. 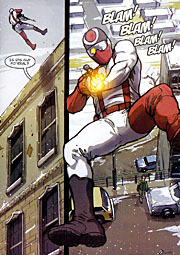 The first few issues of the arc involve the Joes finally getting proactive for a change. Several months before, it was revealed that Cobra Commander had been masquerading as the White House Chief of Staff, and had gained unprecedented access to classified files - including the real identites of everyone who had ever served with the Joe team. Finally feeling that things had been pushed too far, the president gave the Joes carte blanche to destroy Cobra once and for all. To that end, they're hunting down everyone who's every worked for Cobra, looking to permanently cripple the organization. 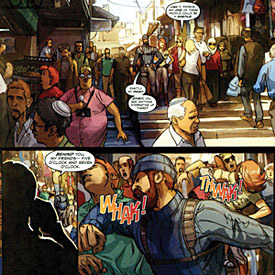 This section not only gives us a lot of good globetrotting adventure, but also a nice bit of characterization for the Joes. 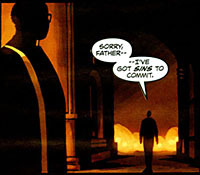 Take issue 27 (Part 3 of the arc), for instance, which balances a tense battle for survival in the Namibian desert with a quiet meeting between Duke and his father. While we see the depths of Shipwreck and Cover Girl's will, we're also learning more about Duke than we ever imagined. Meanwhile, in the C story, we see the edges of the carpet start to unravel, and get a sense of what's coming. But all this is just overture. What makes "World War III" so impressive is its unbelievable scope. This isn't Cobra kidnapping scientists to hold for ransom - they're actually looking to take command of the world, and for once it looks like their goal is in reach. After months of careful planning, Cobra is ready to stage a coup against every major world power at once, and install Cobra Commander in their place. And at the end of issue 28 (Part 4), the war begins - the next issue, we see the kind of losing odds the Joes are facing as things start to fall apart, and they find themselves stranded far from home when they're needed most. World War III begins in earnest in the double-sized issue 30: halfway through the story. 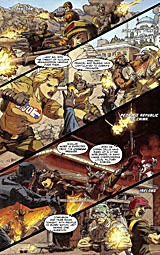 The next three issues have a nifty triptych cover showing a big battle scene between the Joes and The Plague - Cobra's new elite force - and the story inside follows suit. This is when things really get huge, as we jump all over the world to follow Cobra Commander's intricately planned attacks and the reservists' attempt to hold them off. And just when it looks like the tide is starting turn, Cobra initiates their catastrophic final solution. Often with stories like this, the effort to show what's happening everywhere on Earth at once just makes things muddled: you're left scratching your head about who's where and what everybody is supposed to be doing. Thankfully, that's never an issue here - whether it's because of Mark Powers' writing or a strong editorial hand on the part of Mike O'Sullivan, I couldn't say, but the story reads very easily. "World War III" is a story that absolutely lives up to its name and its premise. There's plenty of good military action, particularly when the forces of good start trying to co-ordinate their respsonse and deploy around the globe. But before that, there's also a bunch of Bourne Identity-style fighting and chases. After all, the core Joe team is only about a dozen people, so when we're following them, things necessarily get a bit close-quarters. Everybody gets their time to shine, too, so it's not just "The Snake-Eyes Show (And Friends)" the way it's often been in the past. The art varies throughout the story - but since this was originally told over a 12-month span, and included several double-sized issues, that isn't really a surprise. Can't blame a guy for needing a little backup. Mike Bear is the main artist, and he has a clean yet somewhat sketchy style that works well for the story. Small figures (such as crowds or extreme long shots) lose detail, but the characters all look distinct, so you can tell who everyone is even when they're not wearing their familiar uniforms. Mike Shoyket is the main backup, and his style is much rougher: not unrefined, just with much more rendering. It's somewhat reminicent of Jae Lee's style, but more decipherable. Eventually we also get Pat Quinn, whose art blends much more seamlessly with Bear's. Helping these three guys mesh so well is the able coloring of Jean-Francois Beaulieu, who does a particularly nice job on the story's many flashbacks: there's no textual cue that we've stepped into the past, but the desaturated colors send the message. 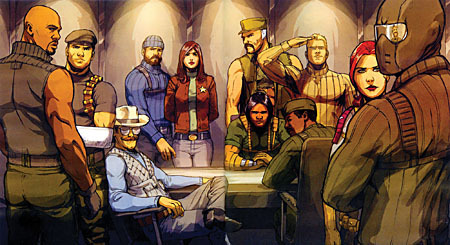 There's still no official word about whether IDW will be continuing the continuity of GI Joe that's been running since the first comic came out in 1982, but after reading "World War III," you can probably guess that they won't. Devil's Due want out with a bang, and has pretty much left nothing behind them. 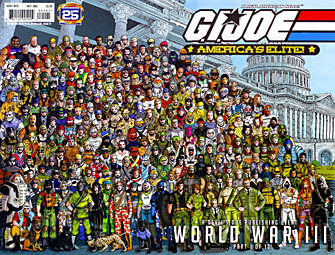 The story featured an appearance by pretty much every living Joe or Cobra, and more: there were some characters based on JoeCon exclusives and those weird foreign repaint figures from the '80s, like Quarrel and Cobra Mortal. 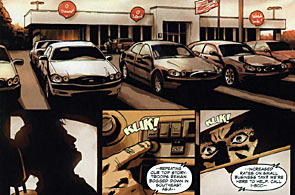 The story wraps up not only plotlines from Devil's Due, but even some callbacks to the Marvel comics. IDW will probably have to start a new continuity, because with this story, Devil's Due ended the world. DDP wasted no time in getting "World War III" collected into trade paperback form - the collected Omnibus Edition came out only two weeks after the final issue, so there's no excuse for not picking this one up right away. It's available at Amazon, your local comic shop or even direct from publisher DDP's website. 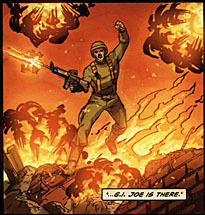 "World War III" was a great finale, and if it's not the best GI Joe story ever told, it's certainly in the top five. If you were ever a fan of GI Joe, you owe it to yourself to pick this one up.